Also, don’t forget that our beat’s CAPS meeting is Wednesday, October 5 at 7pm at the 19th District Police Station, 850 W Addison St. This entry was posted in ELVN News and tagged ELVN on October 3, 2016 by elvn_updates. This entry was posted in Community News, ELVN News and tagged ELVN, Oktoberfest on August 23, 2016 by elvn_updates. East Lake View Neighbors will be hosting a Board meeting on Tuesday, April 5, 2016, at the 19th District Police Station Community Room, 850 W. Addison at 7:00 PM. Please join us. This entry was posted in ELVN News and tagged ELVN on April 4, 2016 by elvn_updates. A reminder – The East Lake View Neighbors Annual Meeting and Board Election is scheduled for Tuesday March 1, 2016, at 7 PM. Location is To Be Determined, and a complete agenda is forthcoming. Jim Spencer has been a Board member for four years and served as ELVN Chair of the past two years. He also serves on the Board of the Lakeview Citizens Council. Jim, his wife Maureen and their Foster Children Eugene and Gino live in the immediate Wrigley Field area and have been strong advocates in protecting the residential character of east lake view. He has owned and managed an apartment building in the neighborhood since 1996. Chester Kropidlowski has lived in East Lake View since 1991 and has been a Board member for over ten years and is a past Chair of ELVN. In 1998, Chester retired from the City after a 32 year career with the Chicago Department of Transportation as a City traffic engineer. His duties included dealing with Lake View traffic and parking issues and managing the night baseball Neighborhood Protection Program. Since retirement, Chester has worked as a traffic engineering consultant including consulting for both the City and the Cubs regarding the Wrigley Field program. Chester was Chair of the Transportation Committee for the 44th Ward Master Plan and was active in the development of the 46th Ward Master Plan. Chester and his significant other, Lenore, frequently enjoy the many restaurant and entertainment opportunities available in Lake View. Patrick Nagle has lived in Lakeview for over 20 years and has worked as an attorney for 20 years. Patrick currently serves as a federal Administrative Law Judge. He has been an ELVN member for the past several years and is a member of Alderman Cappleman’s Zoning Committee. His wife and he are raising two children in the neighborhood and he is invested in making this community an optimal place for people to live and work. Terie Kata has been active in ELVN since 1991, serving as Chair for five years, and Treasurer for over seven years. 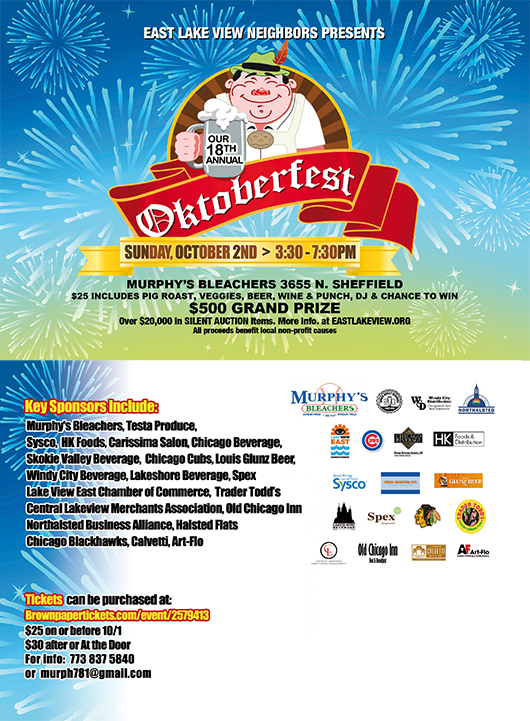 Terie, working as an ELVN contractor and working with our friends, the Murphy Family, raised ELVN fund-raising to new highs in attendance and profits at our annual Oktoberfests. Terie is an active member of numerous community and business organizations including being on the Board of the Lake View Citizens Council. Tom Rothschild has called East Lakeview home for 19 of the 21 years he has lived in Chicago. Currently the Treasurer of his condo association, Tom has been active on the board of every building in which he has lived. His work with the condo board has led him to form relationships with the Alderman’s’ offices. Tom presently represents ELVN in the 44th Wards neighborhood sculpture program. Heather Way Kitzes is proposed to be the Chicago Cubs representative to the ELVN Board. The Chicago Cubs are a long time Organizational member of ELVN. Since April 2015, Heather has held the position of Manager, Government and Neighborhood Relations for the Chicago Cubs. Heather’s current responsibilities include working with local community members on issues surrounding Wrigley Field. Prior to her role with the Cubs, Heather held the position of Executive Director with the Lakeview Chamber of Commerce for nearly 13 years. During her tenure, LCC experienced consistent membership growth, the formation of critical strategic partnerships and drafted and delivered the award winning Lakeview Area Master Plan (LAMP). Over the years, she has served on many local and regional boards including the Alderman Tunney’s 44th Ward Community Directed Development Council; Lakeview Citizen’s Council Executive Committee; Shiel Park Advisory Council; and the Lake View Pantry Board of Directors, among others. In 2014 she was elected as the Community Representative to the Inter American Magnet School LSC. Additionally, in 2012, she was appointed by former Governor Pat Quinn as a Commissioner to Serve Illinois, the state’s commission on volunteerism and service. She believes strongly that service and volunteerism are the key to a well-rounded professional and personal life. Although a long time Lake View resident, Heather currently lives in Andersonville with her husband David and their two children, Jack and Lilly. This entry was posted in ELVN News and tagged board elections, ELVN on February 18, 2016 by elvn_updates. 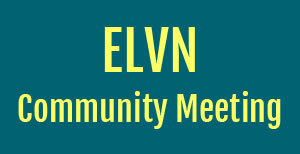 East Lake View Neighbors will be accepting nominations for Board Members of ELVN at our next meeting on Tuesday, February 2, 2016, at 7:00 p.m. in the Community Room at the Police Station located at 850 West Addison Street. We invite all eligible people to consider serving on our Board. If you are interested, please attend the meeting on February 2, 2016, and either accept or submit your nomination. All nominees will be verified for eligibility and will be asked to submit a brief biography which will be considered by all ELVN Members. Nominees will stand for election to the Board at our General Community Meeting on March 1, 2016. 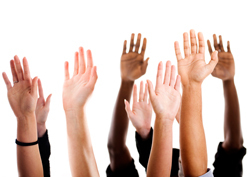 To be eligible to serve on The ELVN Board, nominees must live and own property within the boundaries of our Organization. The boundaries are Lake Shore Drive, Clark Street, Addison Street and Irving Park Road. Additionally, all nominees must have a fully paid membership by February 16, 2016. Please consider this great opportunity to get involved in your Community. 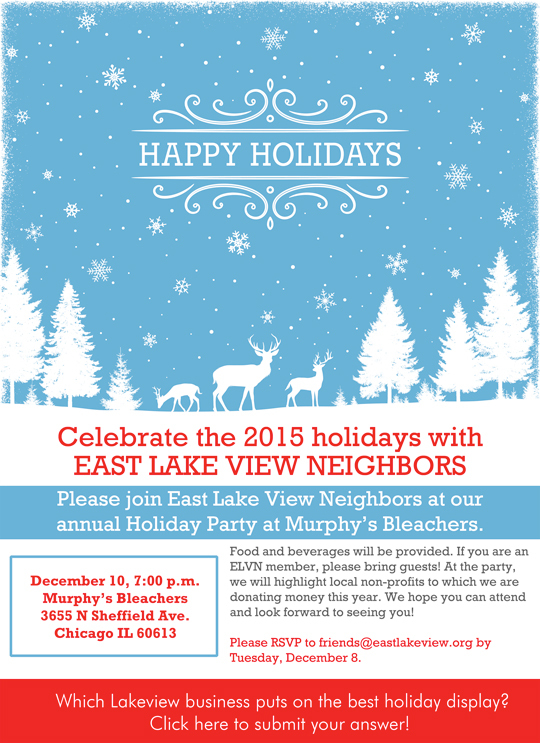 Contact friends@eastlakeview.org with any questions. This entry was posted in ELVN News and tagged board elections, ELVN on January 12, 2016 by elvn_updates. This entry was posted in ELVN News and tagged ELVN, Murphy's Bleachers on November 17, 2015 by elvn_updates.